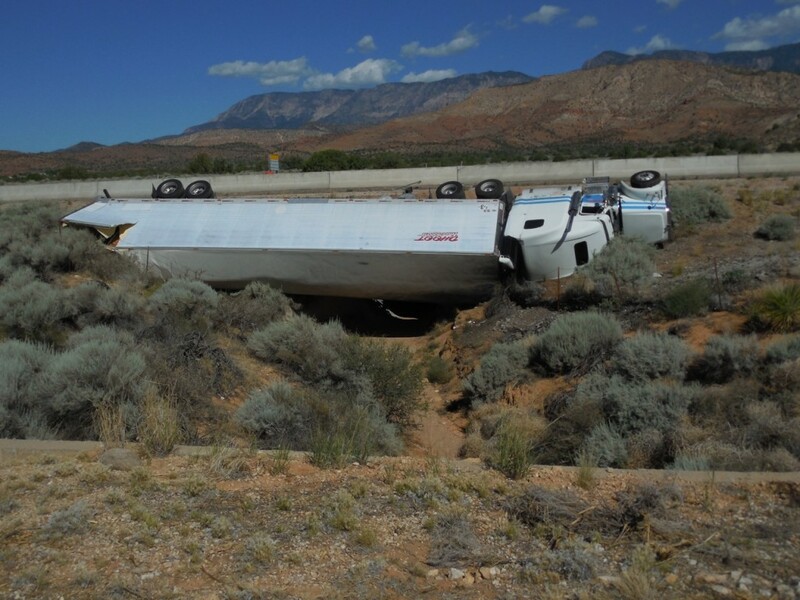 TOQUERVILLE – A semitruck rolled off Interstate 15 early Wednesday morning, landing on its side across a cement water culvert. The hourslong lane closure that resulted from the accident played a role in a three-vehicle collision Wednesday afternoon. 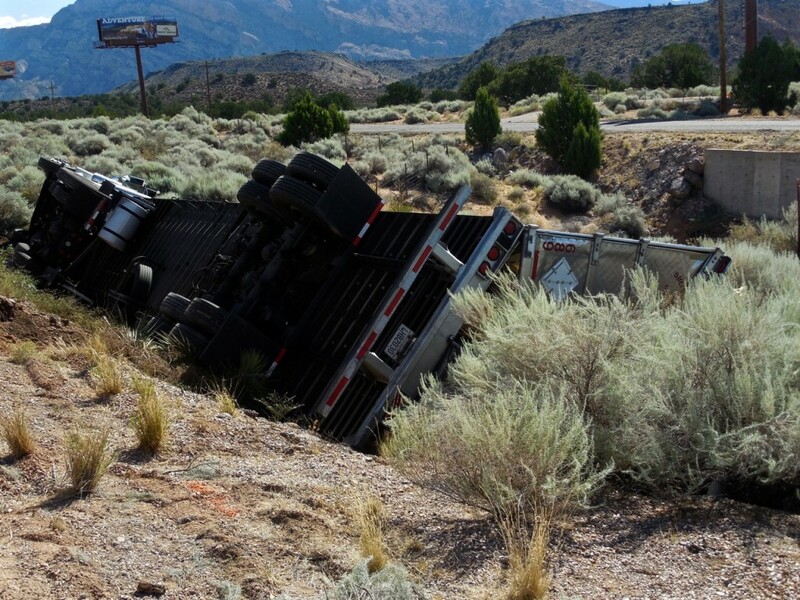 The semitruck went off the freeway at 2:12 a.m. at about milepost 26, just south of the Toquerville Exit, which is Exit 27, Utah Highway Patrol Sgt. Jake Hicks said, . 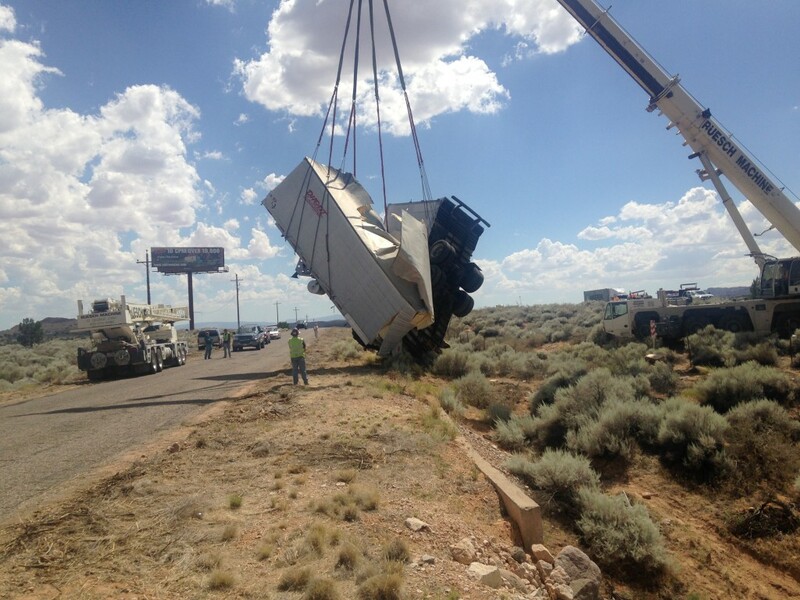 The semitruck was driving northbound in the right lane at the time of the accident. 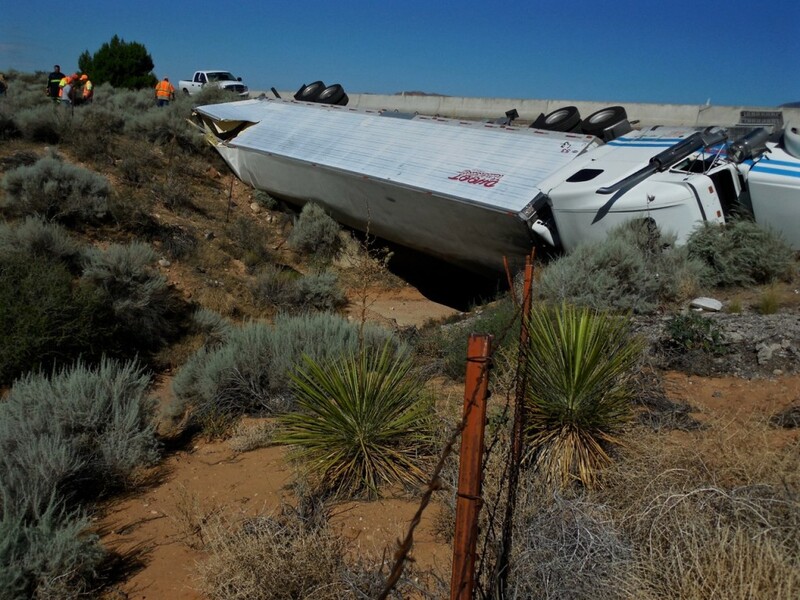 “The truck drifted off the right shoulder basically in a straight line, narrowly missing the guardrail,” Hicks said. 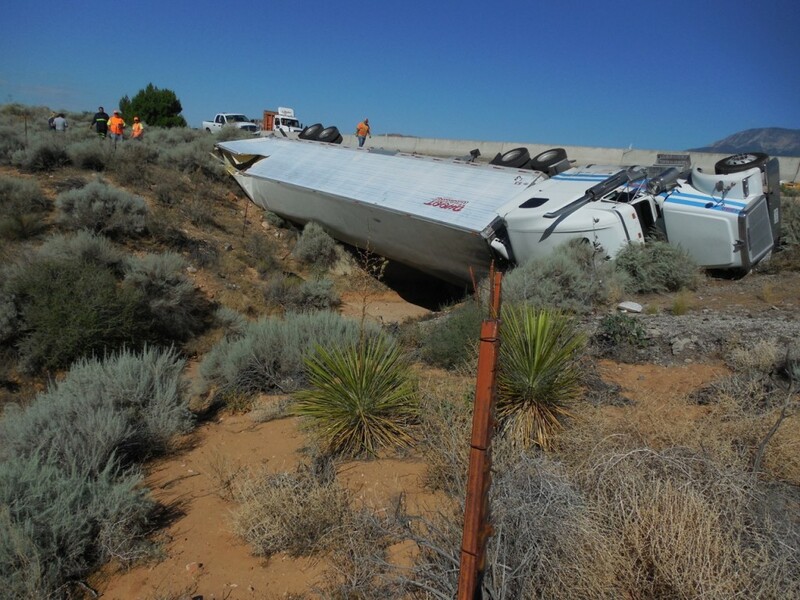 The truck passed to the right of the guardrail on the outside of the freeway. 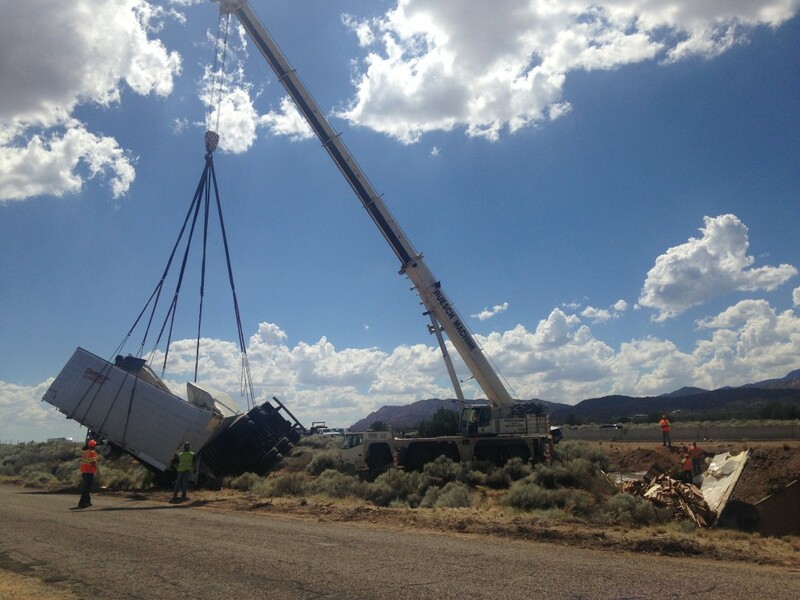 It started going over the culvert, but there wasn’t enough room and the trailer tipped. 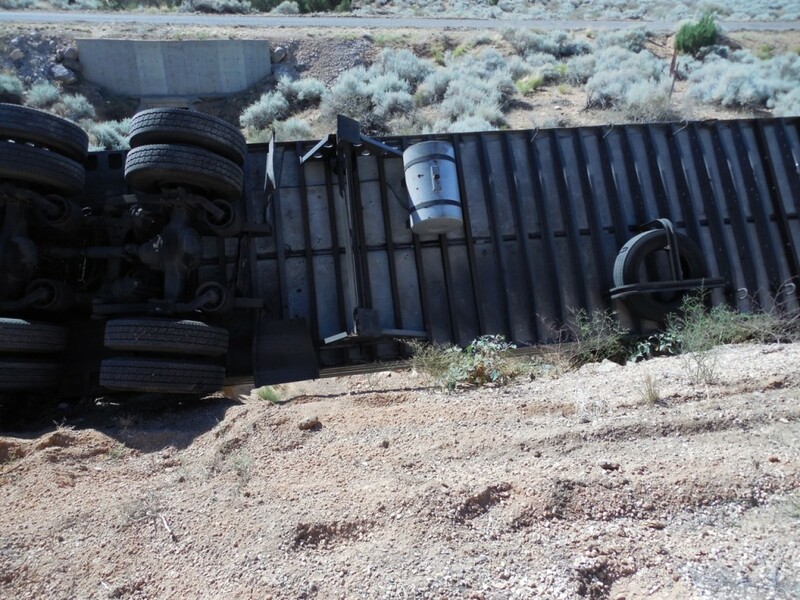 The truck’s speed carried it partly over the 6-foot culvert, and the truck and trailer came to rest straddling the culvert. 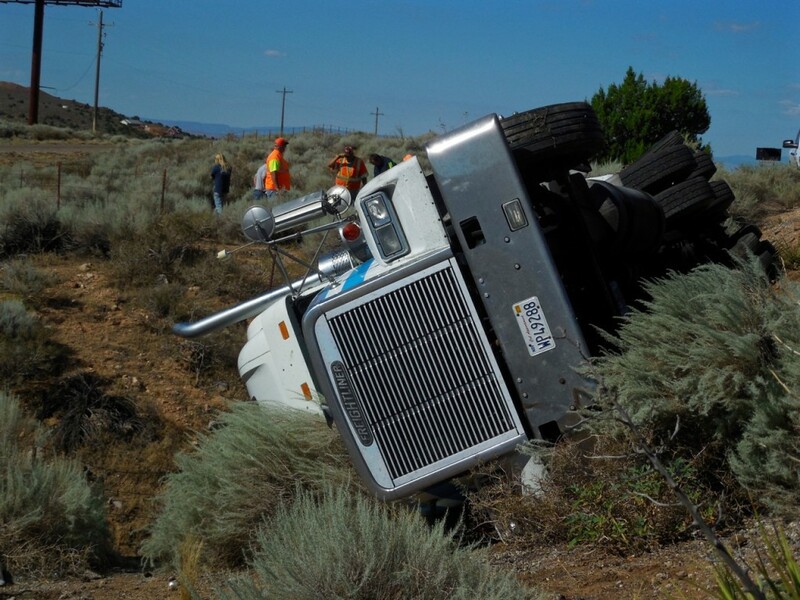 “So it was teetering over that culvert, back tires on one side, the tractor on the other side,” Hicks said. 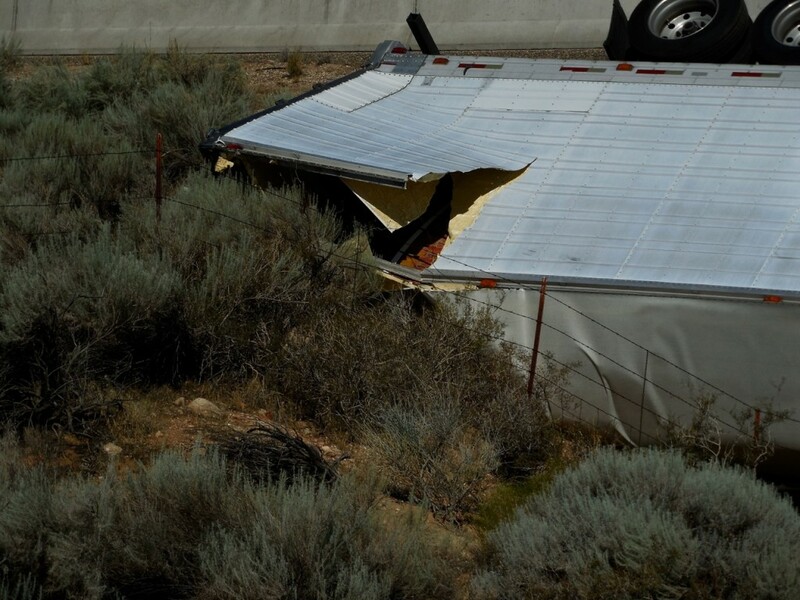 The driver of the semitruck was a 42-year-old man from Modesto, California. 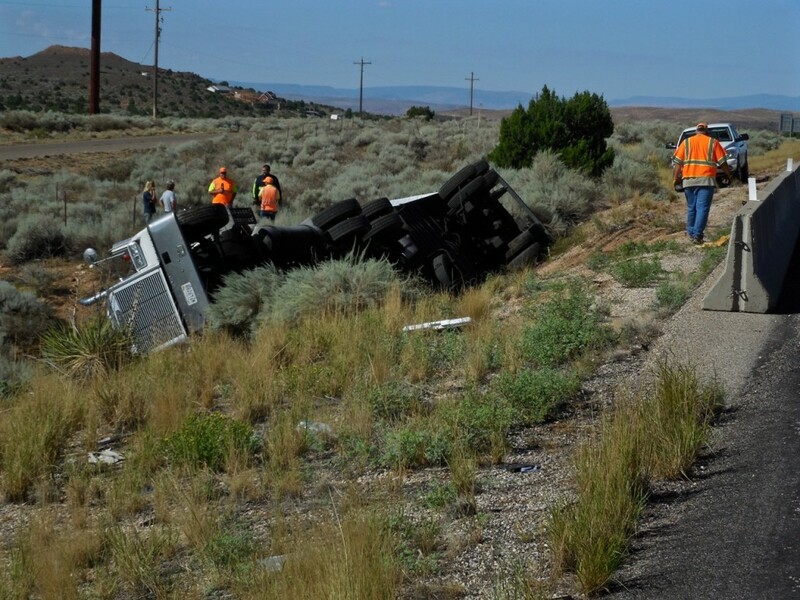 A 21-year-old woman and a 1-year-old girl were asleep in the back of the cab when the accident happened, Hicks said. 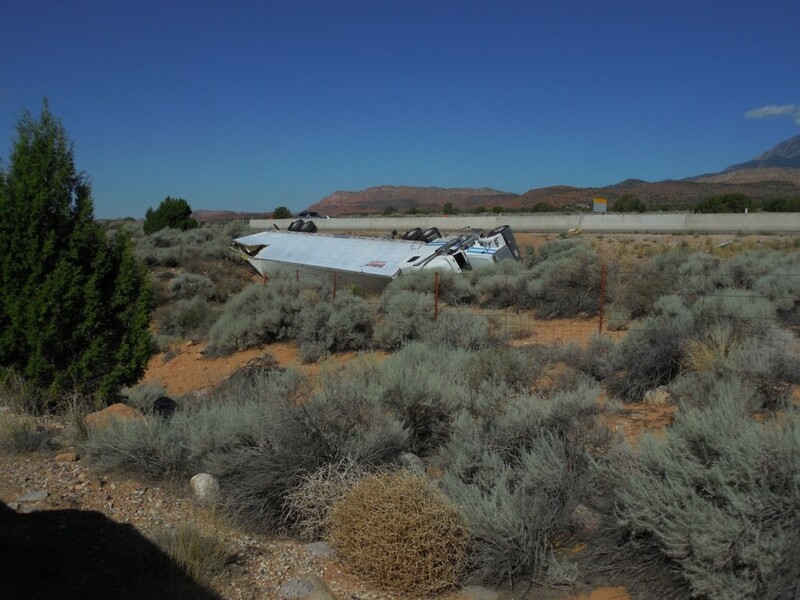 All three were transported to the hospital with minor injuries and were later released. 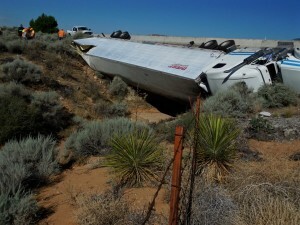 Hicks said it is believed the driver was fatigued or fell asleep, as there were no skid marks. 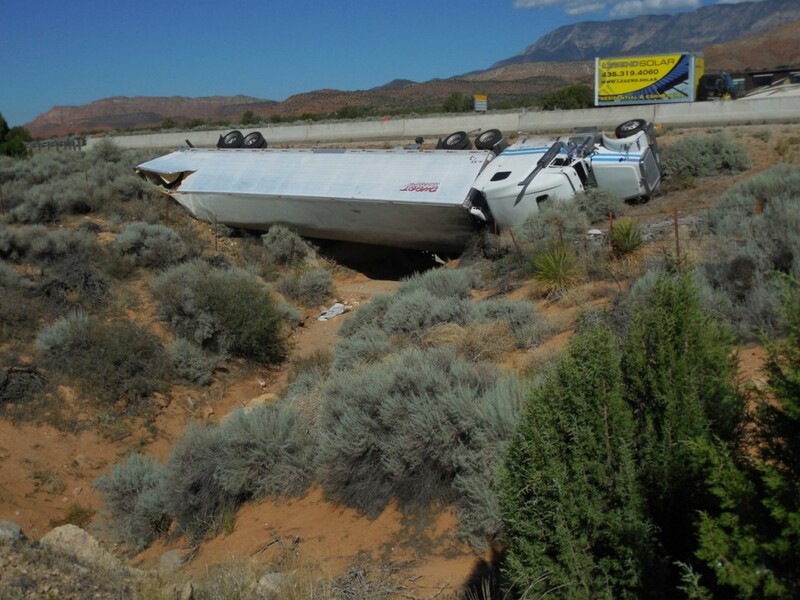 The truck remained overturned on the side of I-15, and the right travel lane was closed for several hours as road crews worked to recover the tractor and trailer. 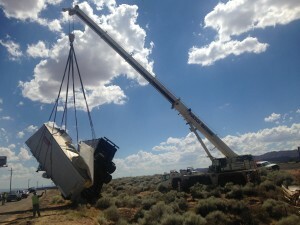 A large crane was brought to the site by Ruesch Machine. As of 4:15 p.m., the semitruck had been loaded on a tow truck. The trailer, which was full of produce, including pineapples and tomatoes, was moved off of the culvert next to a frontage road. 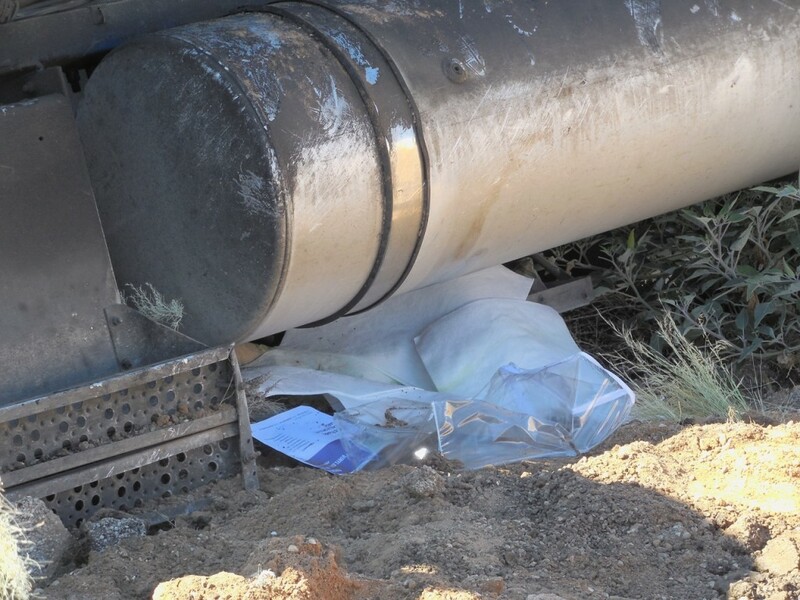 During the operation, the trailer crumpled and spilled pallets of produce. 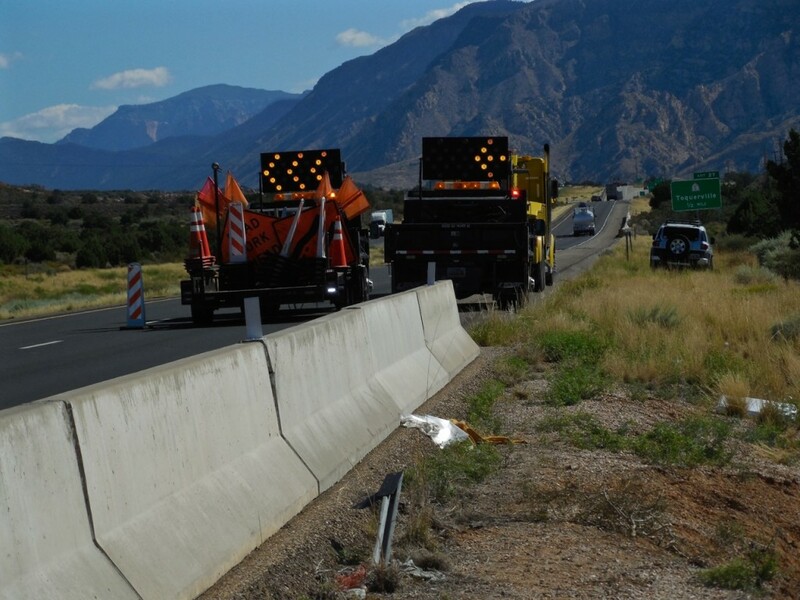 Because of the accident involving the semitruck, travel on northbound I-15 was reduced to one lane from 8 a.m. until about 3:30 p.m., Hicks said, and the traffic slowdown triggered a second accident at 3:07 p.m at mile post 25.5. A Chevy Silverado driven by a 16-year-old girl was traveling north in the right lane, Hicks said. The Silverado ran into the back of a blue Ford Focus driven by a 31-year-old man from Cedar City. 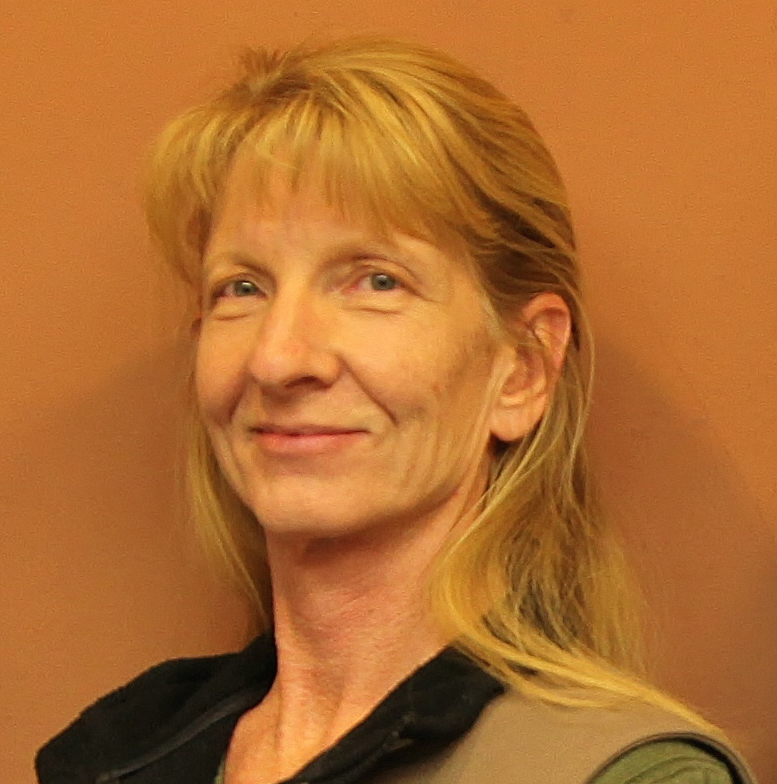 The Focus was hit hard enough to push it into the back of a blue Toyota Sienna van driven by a 47-year-old man from Hurricane, who had his wife and four children in the vehicle with him. Airbags deployed in the Ford Focus, and medical help was called; but there were no injuries, and no one was transported to the hospital. The Ford Focus was badly damaged, he said, but the driver was uninjured.